Learn to kitesurf with some of the world's most experienced kitesurf instructors in the far north of New Zealand between the Bay of Islands and 90 Mile Beach. Our location on the Karikari Peninsula has beaches facing every direction and Kari means wind, so it's one of the worlds's great places to kiteboard. We teach beginner kitesurfing courses right up to IKO kitesurf instructor level, tailoring our kiteboarding lessons around your own skills and progression. A full-on kitesurfing experience day. Power yourself through the water with the kite and get a real feeling for this exciting sport. We think it's important that you get as much time in the water having fun on your kitesurfing taster day. So we don't cover self-rescue techniques on the 1 day kitesurf course, which you will need to cover before you go kitesurfing on your own. But if you get the bug, you can always upgrade to a 2 or 3 day course to cover everything you need to be an independent kitesurfer. The two day kitesurfing course covers all the elements you need to become an independent kitesurfer. You will start to get up on the board and learn the self-rescue techniques. There is a lot to learn to become a kitesurfer so while we cover everything in the two day course, you may want some extra time to practice your new skills, and a three day course gives you the opportunity to do that. Really become self sufficient as a kitesurfer, with the confidence to continue safely on your own. The 3 day course gives you the opportunity to really nail getting up on the board, and become familiar enough with the equipment to feel safe to set up and go out on your own and develop your skills. If you want to continue with your kitesurfing lessons after your three day course with us to develop your skills and confidence, we can add extra days to suit you. If you have had lessons elsewhere that you want to build on, or you just want to improve an element of your riding, come along for a day and we will progress your skills from whatever level you have already reached. Join us at Kitecamp to fast track your learning, gain new skills, or just get out there and have fun. We cater for all levels from beginners through to experienced kitesurfers. 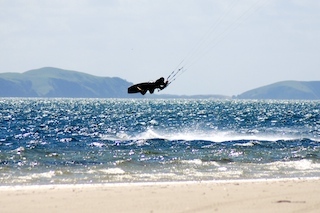 Kitecamp packages include at least three days’ kitesurfing each week, usually more. When you are'nt kitesurfing you can SUP, surf, snorkel, or just chill at the beach or in a hammock. All equipment is included in your package. We provide all equipment including wetsuits and safety gear. But if you have your own, bring wetsuit and booties. You then just need to bring your swimming gear to wear under the wetsuit, a towel, a hat and sunscreen, etc. Everything you would expect for a day at the beach, depending on the weather. Something to eat and drink would be good for some extra energy and in case you end up drinking some salt water! We will give you directions on where to meet depending on the wind direction on the morning of your course. If there is no wind or too much wind on the day of your course we will rebook a time that suits you or refund any unused lesson time if you can't come back. You will never lose any lesson time. We believe you should get real value from your lessons, so if the conditions mean you are not going to progress or get the most out of your session, we won't waste your time and charge you for it. We ask you to call the night before or the morning of your kitesurf lesson to check conditions. This will save you a wasted journey if you have a long way to travel, and the wind is not going to be good. We will then rebook to another time. If you cancel your booked session and we can fill your place we will refund your deposit or rebook your date. If we can't fill your place and have previously turned other students away because of your booking, you may forfeit your deposit. We are an official British Kitesurfing Association (BKSA) and International Kiteboarding Organisation (IKO) school. This means we undergo regular inspections, have procedures and documentation in place that is checked and monitored, and we achieve best practice in our training and safety standards. Our instructors are all IKO and BKSA qualified, and our qualifications and affiliations are kept up to date. Zoe is a BKSA Senior Instructor and IKO Level 2 instructor. Berny is a BKSA Senior instructor and IKO Examiner, at the top level of training in kitesurfing and one of only 20 in the world.